Bell is ringing in the new year with brand new Moto 9 Graphics for you off road junkies. Designed to add some spice to your gear repertoire, the Moto 9 is now available in an Intake, Tagger Trouble, and Tracker graphic, a little something for everyone to get excited about! I’ll start off with the more conservative of graphic options; the Bell Moto 9 Intake Helmet. Coming with a bit more flavor than the traditional solid colors, the Intake is being offered in a two tone Black/Grey or Red/Black (Infrared) colorway with lines that really flow with the shape of the helmet. The front colorway encompasses the eye port gasket, which in my opinion really makes the Infrared scheme pop. 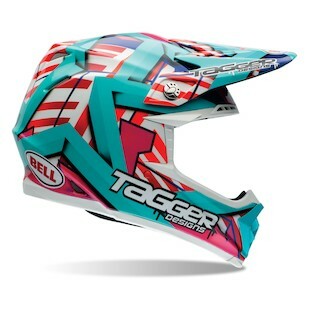 On the other end of the spectrum is the Bell Moto 9 Tagger Trouble Helmet. As you may be imagining, the Tagger has a graffiti-esk flare with some truly vibrant Blue-Green, Red, and White colors (oh and a splash of Pink, too). This design is loud and proud, perfect to add to an already vivid jersey and pant combo or a nice statement to make if your jersey and pants are pretty neutral. 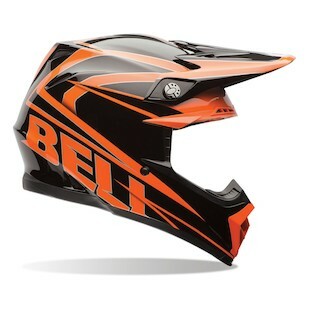 Last up is the Bell Moto 9 Tracker Helmet - a classic graphic that I foresee being in Bell’s lineup for a quite a while. Similar to the Intake, the lines on the tracker flow really nicely with the angles of the helmet and give it that fast look while it is even standing still. 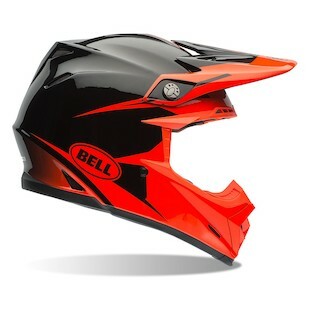 The Black and (RevZilla) Orange is always a company favorite, but Bell also is making this model available in a White and Black if you already have too much color going on. Overall, Bell upped the graphical offerings with the Moto 9 for 2015. This probably came with little surprise considering the existing graphics were all marked down, but it is always exciting to see manufacturers freshen up their product offerings on existing rockstar helmets.